It is with great sadness that we learned of the untimely death of Nancy Trevino this morning. Nancy served as NABO Secretary from 2004-2009, during Mary Gaztambide’s presidency. Nancy always greeted everyone with a smile, and a hug. She was a delight to work with, and the joy that she felt serving NABO shone through to everyone she met. Her dedication and hard work was awarded this summer in Buffalo, with her receiving a NABO Bizi Emankorra Award at convention. Prior to her involvement in NABO, she also served as her local Basque club secretary, Basque Club of Utah, for several years, from the late 80s until 1992. Her daughter shared with us that during this time, in true Basque fashion, she requested permission from her workplace to make copies in order to save the club money. Besides her dedication to the club, she was also a very dedicated dance mom, and followed the Utah’ko Triskalariak in their travels, and on their numerous performances. 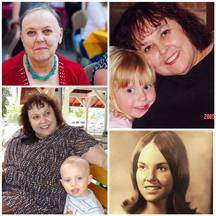 On behalf of everyone at NABO we extend our sincerest condolences to her daughter, Christina, and her family Dominic, Elaia and Xanti, as well as to Nancy’s siblings, and extended family as well as to all of her many close friends and NABO family. Goian bego. Ontario Basque Club will be celebrating 71 years at its annual dinner, dance and auction on February 24th at the Four Rivers Cultural Center. Doors open at 6:00 with dinner served until 7:30. The Beti Alai dancers will perform at 7:30 followed by the lamb auction at 8:00. There will also be a silent auction. Proceeds benefit local community projects. There will also be dancing to the Boise band, Simple Ruckus. In conjunction with the dinner dance, the Four Rivers Cultural Center is exhibiting the Basque Museum’s Hidden in Plain Sight: The Basques that was originally shown at Ellis Island in 2010. The exhibit will remain on display until April 2nd. 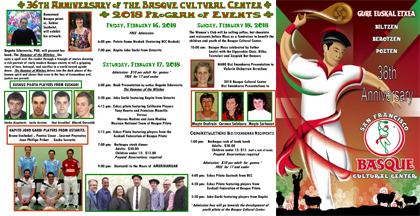 In the same vein, and to explore the history of the Basques that settled in the Ontario area specifically, the Basque Club has recently expanded its Sustraiak: Our Basque Roots Project that began in 2004. In addition to the mobile display, the project now allows public access to its database that contains over 5,000 individuals linked in families. This database encompasses the families of Ontario Basque Club members throughout the years as well as all Basques buried in Ontario's Saint John's (Sunset) and Evergreen cemeteries, their siblings, descendants, ancestors, and extended families. The digital collection of obituaries, photos and more will be useful to Basques in the western Treasure Valley as well as family in the Basque Country who may be curious to trace their relatives’ trajectory in the diaspora. Tickets for the dinner dance are $25.00 for adults and $7.50 for children (ages 3-1). A dance-only ticket is available for $10.00 with admittance after 7:30. Tickets may be purchased online or you may call Maria at (208) 739-1837 of Christina at (541) 212-1163. We would again invite everyone to join in the fun this weekend at the San Francisco Basque Cultural Center celebrating its 36th Anniversary. The weekend is jam-packed with events including art exhibits, book presentations, talks, pilota, NABO meeting, mass, tributes and as always tons of great food, drink and dancing to the music of Amerikanuak. For complete information on all of these events, please visit this updated flier. Zorionak eta ongi ospatu!